Other types like tremolo, octave, minor tunings, bass and chord harmonicas, tend to be for special purposes. The key of "C" is the best first key for diatonic. After the key of C the next most used are "A", "D", "F", "G", and "Bb"
Of course, if there is a song in a particular key that you want to play along with, then you would need the correct diatonic key for that song. For the Chromatic harmonica, we always recommend "C". 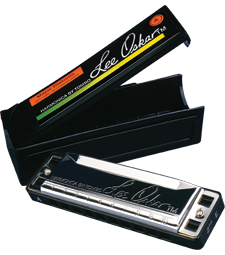 Working with scales will allow you to play your chromatic harmonica in any key you choose. Unless you have a special purpose or reason, you do not need to buy a chromatic harmonica in any key other than the key of “C". wood and plastic combs. Most tone is from the Players technical ability. Wooden combs are now sealed - so will not expand and contrast moisture.